End of Summer Patio Party and Scholarship Fundraiser! The July 5 Rotary meeting where we both honored and roasted our outgoing President Lorraine Gaskins. President Ron began by highlighting some of Lorraine's accomplishments this past year. Past President Amanda then spoke about Lorraine and her passion for youth exchange. She then introduced Peter Wallin from Elmira Sunrise who spoke about Lorraine when she first joined Rotary at the Sunrise Club. Then Polly, Laurie and finally Angela Roasted Lorraine with humor and affection. Preparing for the next Diven Project. Oh such fun. We now have the two training dates at The Glen, AND and on-line training option. Pick one and get certified. Remember this is not just for Rotarians, but friends, family, colleagues, and anyone your can bring to volunteer with you. The Glen will be paying Camp Star $7 an hour per volunteer. So, if I bring my two daughters and we volunteer together for 5 hours, we have earned $105 for Camp Star and had some great family fun too. Here are the details. AGAIN - it is important that volunteers read the training material but also VERY IMPORTANT to take the quiz so our group gets credit for the people who trained outside the walls of the training room.The online training will be beneficial and convenient for many Rotarians who don't want to make 2 trips to the track back to back. Contact Bridgett Stewart at goodb0322@netscape.net to claim your spot. Diven Elementary School 8th Day of Giving 2015. The Elmira Rotary Club hosted our newest charity event, the Lip Sync Battle. This event is modeled after Spike TV’s new hit show, “Lip Sync Battle” and the Tonight Show host, Jimmy Fallon’s frequent lip sync challenges. Performers (individuals or teams) select their favorite song and perform their version of it. Diven Elementary School Students and the Elmira Rotary Club provide over 40,000 polio vaccinations. The Pennies for Polio campaign began at Diven Elementary school with a presentation by three Elmira Rotarians; Tom Weidemann, Joe Kozan. and Fred Kelsey. Using a wheelchair as part of the presentation, the Rotarians challenged the 2nd graders to create an in-school Public Service Announcement and spearhead a penny drive. Why pennies? Because a single vaccination for polio costs only 14 cents. As part of the challenge to the students, Fred rounded up 14 other Rotarians and friends to match up to $100 the amount raised by the students of Diven. So . 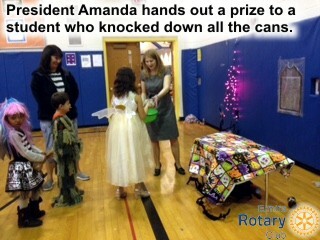 . .
Diven Elementary School and the Elmira Rotary Club raised over $1,400 to fight Polio. Rotary Club of Elmira volunteers serving lunch at the Elmira Community Kitchen. We served over 100 meals. Rotary Club of Elmira volunteers serving lunch at the Elmira Community Kitchen last Saturday. We served over 100 meals. Our Student-partners from Diven Elementary School collecting Pennies for Polio. Post by Elmira Rotary Club. 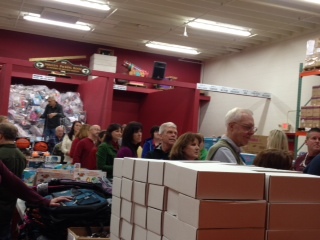 Rotary participated in packing night at Arctic League on Wednesday 12/17/2014 and assisted 130 children with receiving gifts for Christmas. This is a project that Rotary does every Christmas season to help our local community with a making the holiday's brighter. We have Pictures! What a fun day with the kids. On Monday, December 15th at 10:30 a.m, Diven Elementary School will be holding a ribbon cutting ceremony to unveil the latest addition of four beautiful new benches to the Diven playground. The benches were recently installed with the help of the Elmira Rotary Club, which has been an active Diven partner for eight years. The Elmira Rotary Club secured a grant for a portion of the project and hosted a summer rummage sale to earn the matching funds required to install the benches. The new benches will support our families and community who use the playground after school hours by providing a place for conversation and rest. 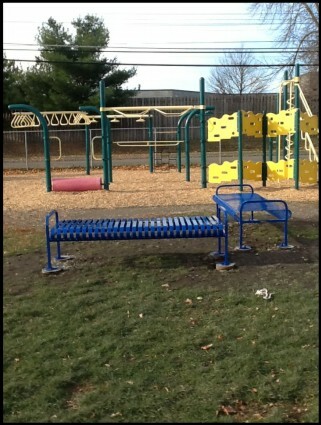 The benches have also been designated as “buddy benches” for use by the Diven scholars. Children in need of a friend to play with or talk to can simply sit on one of the benches, signaling to others that they are in need of a buddy. 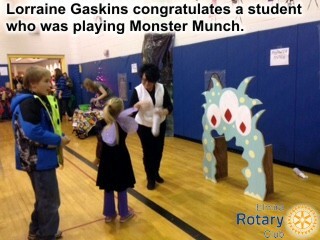 Diven School hosts an annual Halloween Dance for students and parents from both Diven School and Hendy Avenue School. 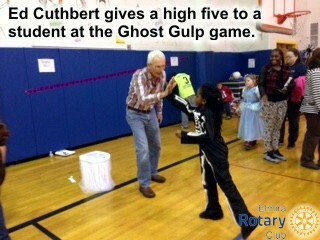 Our Rotarian volunteers staffed some of the games the students got to play. 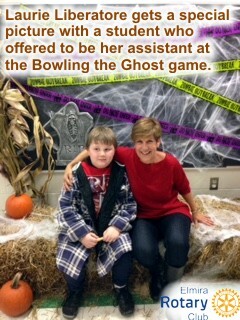 There was music, pizza, prizes, spooky decorations and costumes! It was great fun for all!!! The Elmira Rotary Club honored two dozen Chemung County high school seniors on Tuesday, giving $4,500 in scholarships to three of them. Seniors from Elmira and Notre Dame high schools and Twin Tiers Christian Academy were celebrated at the 27th annual Youth Salute, held at the Holiday Inn-Riverview in Elmira. The students were selected for the honors for their leadership, community involvement and academic achievement. 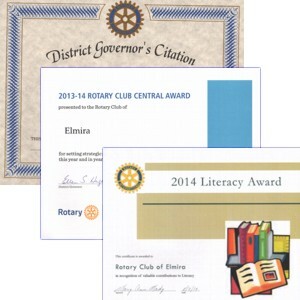 The Elmira Rotary Club was honored to take home 3 awards at this year's District Assembly. 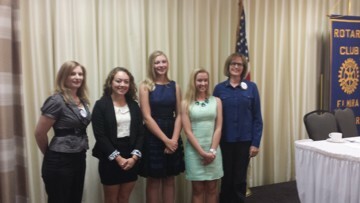 2013-14 Rotary Club Central Award. This is for seeing strategic goas to Engage Rotary, Change Lives this year and years to come. 2014 Literacy Award. In recognition of valuable contributions to Literacy. This is part of our on-going work with Diven School. What a great opportunity to read to children. Pre-K to 2nd grade. For the 1st four Mondays in March, we are going to be reading to the children for 30 minutes. There are 8 different volunteer opportunities each Monday. You can sign up for your time slot here. To complete the process of signing up, select your preferred volunteer time, enter your name, and press the "Signup" button at the bottom of the page. Join us for some fun with the kids. The Elmira Rotary Club recently announced this year's winner of the Four Way Test award is John Humphrey. He was selected from the 60+ members as being a top example of live the Rotary Four Way Test, a measure of ethica, service-to-others conduct. The Elmira Rotary Club donated 24 pumpkins to Diven Elmentary, one per classroom. Here are some of the results. Be sure to leave some of your thoughts on the pictures. Elmira Rotary Club's oldest member, Archie Kieffer, turned 90 on March 27.